In 1886, Gauguin did little painting but created ceramics instead. Soon he fell ill and was hospitalized for a month. He dreamed his old dream of leaving Paris for a warmer climate, perhaps in pursuit of his dream-like memory of paradise. In April of 1887, he left to Panama, where his sister’s husband was working as a business man. Yet, Gauguin’s paradise was soon met with the reality of poverty, illness, and neglect. Even Martinique became unbearable. Without the money for the passage, Gauguin had to work as a deck-hand to return to France. Yet, this trip was a turning point in his career. He brought back with him 12 pictures. These began to have brighter colors and tapestry-like design. It was his first break with Impressionism. In February of 1888, Gauguin returned to Brittany. He left in search for “wildness and primitiveness”. At the beginning of his stay he was ill and the weather was bad. Yet, as spring came he became healthier and the weather cleared up. He painted frequently, but without really developing as an artist. That is, until Emile Bernard arrived in August. Bernard brought with him a style which he had just invented – cloissonism. He believed that the basics of geometry and color could better express emotion than a painting that followed reality too closely. 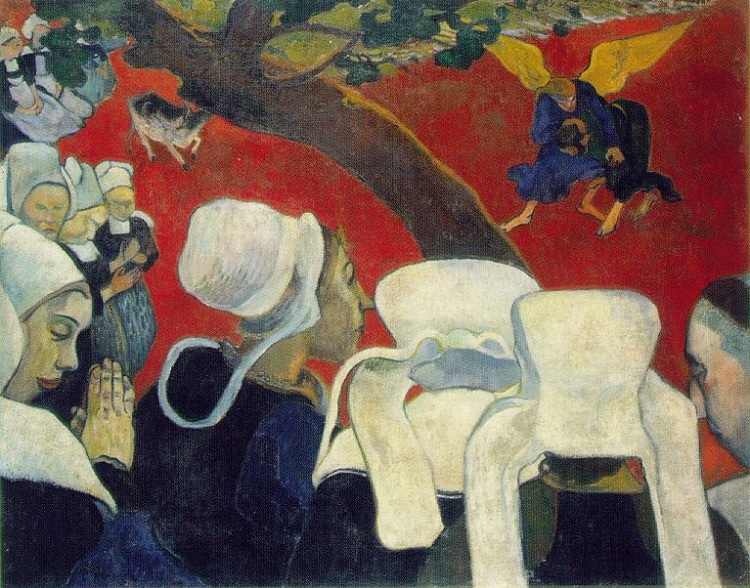 After Bernard’s Breton Women in the Meadow, Gauguin painted his masterpiece, The Vision After the Sermon. It held a similar idea, yet Gauguin painted the Breton women in a more realistic style and their vision in the more emotional style. He wanted to give the work to a local church so he and his friends carried it to the nearby village of Nizon. However, the church would not accept the gift, and thus it was removed. However, he did not want to pass another winter in England’s climate. There was another offer on the table. Theo Van Gogh gave Gauguin an attractive deal to go and live in Arles with his brother, Vincent Van Gogh. He also had felt like he owed it to Theo Van Gogh since he was the first art dealer to give Gauguin the backing and support he needed. Their life together in the Studio of the South ended violently and after Vincent sliced off his own ear (or after Gauguin cut off Vincent's ear, it depends on the theory), Gauguin quickly left to Paris. Gauguin, again, was unable to paint much in Paris. The new style was excluded from the official exhibition, so Gauguin and his friends got permission to hang their pictures in the Café des Arts, calling themselves the Impressionist and Synthetist Group. Gauguin was the now-acknowledged head of the new movement which challenged the avant-garde primacy of the neo-Impressionists. However, their work at this exhibition made little impact on the public. During this time, Gauguin was less interested in the artistic works occurring around him and more interested in the Universal Exhibition of 1889. Not surprisingly, his main interest was the colonial section. He also collected photographs of Buddhist and Cambodian art. He began thinking of going to Tonkin in French Indo-China and negotiated with the French Colonial Office to make the trip. 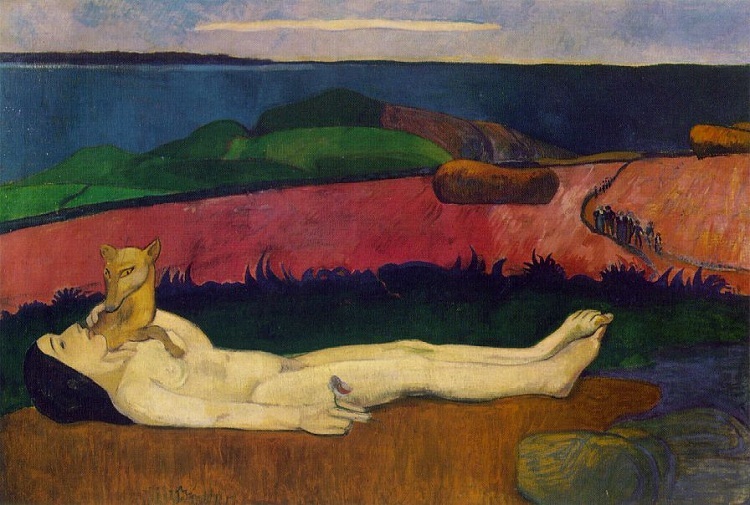 While waiting for clearance to take his trip, Gauguin travelled once more to Brittany. The area had changed and Gauguin was taken aback by how crowded and civilized the area had become. He remained there most the summer but moved him and his supporters to Le Puldu to the inn of Marie Henry. At the inn, the painters were allowed to decorate the living room as they pleased. From 1889-1890, Gauguin had difficulty expressing through the subject matter he was using. He felt that he had exhausted the possibilities of Christian iconography and his paintings of Breton subjects were not particularly successful. In 1890 he painted The Loss of Virginity. It was laboriously symbolic. In his work it alone uses such obvious and arguably forced symbolism. To find his subject matter Gauguin left France for Tahiti in 1981. "Concentrate your strengths against your competitor's relative weaknesses"
>Website by Unified Development, Inc.